Nothing to show today as I am busy with the stitches: Holmsey and Fergus are being very busy bees indeed though I think I should perhaps teach them to stitch and reduce my workload! I was sat on my bed working this morning when I heard a rustle..I glanced down towards the bedroom curtain and there, cautiously sniffing the air was a little field mouse. It's so cold here at the moment that I reckon he fancied a bit of central heating. Sadly, mice leave little 'messages' to other mice showing them the way in so I will have to take anti-mouse action but we will try to keep it humane. I think he wants to meet Holmsey and Fergus so maybe he will feature later on. He is certainly a wee character that's for sure! He showed no fear at all when I yelled gently called my hubby! Just looked me in the eye, twitched his nose and slowly walked back behind the curtain! The cheek of him! I'm not scared of mice but I wanted hubby to see it...he didn't but we did manage to work out which little hole he sneaked out of. Ah, the joy of living in a 200 plus year old stone farmhouse! This was Holmsey's First Appearance and one of my favourite charts. I love rabbits and especially hares. I used to foster rabbits for the RSPCA and they can be real characters. Highly intelligent! And I suspect a certain little wolly rabbit has been inspiring me. Julie made me one of her knitty rabbits oh, a few years ago now and that little rabbit sat on my bedside cabinet all through my cancer treatment. She now rules the roost in my craft room...I will have to get a picture of her for you in my next post. I've been sorting out my craft room and have oh so many things made to me by friends which have been gifted, drawn or offered in RAKS. And if you have ever made me something I promise, it is there, in my craft room. I could never part with a single thing! Oh What would we do without our blogging buddies! I have made genuine friendships through my blog and I treasure every one of them! How about a free draw to go along with the lovely warm fuzzy feeling friendship brings? If you could own any one single chart designed by me, which would it be? Just comment on this post only! Might also be nice if you shared the post to spread that fuzziness! I will draw a name on my next post and will send you a hardcopy version of the chart you requested! Right, the sun is shinging, the ground is solid with ice so I think I will go and do some work in the polytunnel. I love little meeces but like you not indoors. My Dh often finds little nests in his workshop where he keeps his glass kilns they must think it heaven in the winter months. Oh may I be first in the queue for a chance of Marleys Ghost pattern as it would accompany Bah Humbug. I have to wait a while before I can order God Bless us as that will go well too but I am on the wagon but have a birthday coming up lots of hints dropped. Miss Julies bunnies are gorgeous arent they . I have a family Seemore came first but he needed a bride so Miss Rose came to marry him, you know what bunnies do best, Milly and Maisie the twins arrived then now they are a happy family that sit on my window sill next to my stitching chair. Blimey that was a long comment ,loads of hugs. I believe you did a chart with gingerbread men which I loved but can't remember the name if the chart. Well done on the designing the charts are lovely. Friend Hare and The Scent of Ginger are my favourites! Glad you saw the wee mouse instead of it coming to visit me! I couldn't make up my mind so I'll stall until you draw a name. Right now I'm torn between Friend Hare (I do love this series!) and America Rules (as I don't have many patriotic finishes). Thanks for sharing! Little mice can be so cute ~ but definitely unsettling when found in the house! I love Friendship Hare ~ so cute and true! I have had mice as pets, and so have my daughter and currently my eldest granddaughter! Just something about them... tho of course, I do not want them in my house outside of a cage! No bugs, no critters! I do not need to enter... postage is too stupidly high! But I do enjoy seeing the new designs you have! Big hugs! May be little Manny was modeling. He has been spying on you, designing all those charts with Holmsey and Fergus and was feeling jealous...green with envy. He just wanted to be the star of one of your wonderful patterns...Mouse Kisses for Valentine's Day or Muffins for Manny. But if I had to choose one of my favorite charts that you have already created, mine is Hare Friendship! Take care! EEEEK a mouse... nice to look at and especially nice when they are in a train exhibition lol, but not inside your house, I hope he soon finds a new home for his family. From experience I say mice love Nutella (a housemate I lived at the time used it in a humane trap then rode the mice on a bike across the river - a bit futile as according to the neighbour we had a massive colony leaving in the field behind the house). Good luck! I was not as chuffed about the wee fellas and actually threw cheese at them (I did not know then that they actually do not like cheese). I do own my favourite design by you (and I am still killing myself over the fact I could not answer which year Charles Dicken's wrote the Christmas Carol in a Christmas quiz). But I do like cute bunnies. 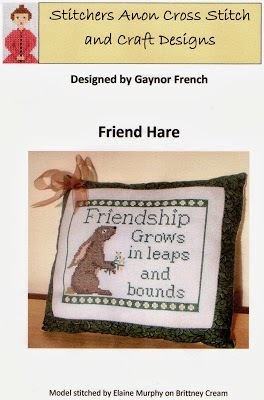 So am not impartial to 'Friend Hare'. Am I right in thinking that you are designing some more? Hope the weather is good! and not too many drafts come through the mice holes. How do you mean to share it? To write about your offer on my blog?